The ActionLine A83809 is an elliptical trainer made for home use in the same range of price and specs as the Gold’s Gym 350i or ASUNA 4300. It’s a machine for light to medium workouts, without fancy features, such as sound system or online connectivity. It also does not have an incline system. But on the other hand, it does offer a fair amount of programs to keep you motivated, while its resistance is motorized (automatic). Although it’s a home-use mid-range elliptical trainer, the ActionLine A83809 features a sturdy frame made of steel tubing. In fact, most of the parts in its construction are made of steel, with the exception of the pedals, drive system cover and several joint covers. All the steel parts feature a durable, corrosion-resistant powder coating and the color used is dark gray, this being the only color available for this model. Several websites rate the ActionLine A83809 elliptical trainer for a weight capacity between 250-300 lbs (113-136 kg). However, its maximum weight capacity is 250 lbs (113.3 kg), so if you weigh more than that, it’s best to choose a different machine, such as the Schwinn MY17 470, for example. This elliptical machine is not too large. With the frame fully assembled, it takes 58″L x 27″W (147 x 69 cm) of floor space. In other words, it’s approx. 12″-13″ shorter in length than other trainers, such as the Nautilus E618, for example. The frame doesn’t fold, but its front base is equipped with transport wheels so you can easily relocate it once you have finished your workout. It’s not extremely heavy, though; it weighs approx. 96 (43.5 kg) when fully assembled. Also, its rear base bar features adjustable stabilizers. There are two sets of handlebars available on this elliptical, fixed and mobile. The fixed handlebars incorporate EKG pulse sensors, so the console can track your pulse. The mobile handlebars feature long grips with round caps at their ends, offering the possibility to hold on to them in various ways, in order to focus different muscles. Both sets of handlebars are rubberized in order to provide a secure grip. The pedals are quite large; they can accommodate athletic shoes of all sizes. They’re made of heavy-duty PVC material and attached to steel bars, so they should be able to support users up to 250 lbs (113.3 kg) with no problem. They’re not articulated, though, and cannot be adjusted in any way. But due to their size, you can place your feet on them in different ways. The joints between the pedal arms and mobile handlebars, as well as the joints between the moving bars and the console mast, integrate sealed ball bearings. Therefore, the pedal and arm movement is very smooth. An important aspect to mention with regards to this elliptical is that it doesn’t have an incline system. In case you’re looking for a machine in this price range that also has an incline system, the Schwinn 430 MY16 may be a good choice. Its stride is 13″ (33 cm), which is fairly short especially for a user over 6’0″ (183 cm). So, this being said, it’s not exactly a machine for workouts that involve a full stride extension. The machine’s stride is also non-adjustable. The pedals are approx. 8″ (21 cm) above floor level, at their lowest point. At their highest point, they’re about 7-8 inches higher. Therefore, to avoid any ceiling height issues, it’s best to place and use the elliptical in a room with a ceiling that’s at least 20″ higher than your own height. 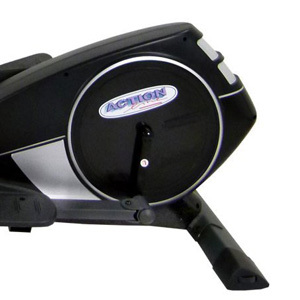 The ActionLine A83809 elliptical machine is equipped with a mid-range flywheel. It weighs 18 lbs (8.1 kg), which is sufficient for providing a consistent momentum. It’s also perimeter weighted, which means that it delivers a very smooth and steady pedaling motion. 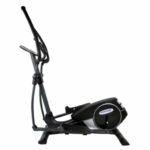 Most elliptical trainers with magnetic resistance have a belt drive system, and the A83809 doesn’t make an exception. Its transmission is provided by a durable and stretch-resistant belt. Since it’s a belt drive, it doesn’t require lubrication. Also, the pedaling motion generates almost no noise. 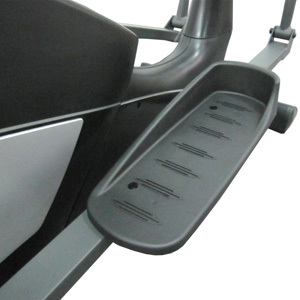 Even though its elliptical path is horizontal, due to the fact that it’s a rear-drive elliptical, the pedaling motion may give the impression of going downhill. The pedal arms are attached to a heavy-duty, 3-piece crankset, with steel crank arms. The pulley is slightly larger in diameter than the flywheel, and the joints between the pedal bars and the crank arms also integrate solid ball bearings. As we’ve mentioned above, this ActionLine elliptical trainer features a motorized magnetic resistance system. This means that you have to connect it to a power source in order to benefit from the adjustable resistance. An adapter and power cord are included. Also, the resistance can only be adjusted from the console. The machine’s resistance system consists of a small magnetic brake and a servo motor. As you select a certain resistance level on the console, the motor will adjust the brake’s position in relation the flywheel, which can result in more or less pedal tension. The machine makes available 16 distinctive levels of resistance. The first resistance settings promote light workouts, great for elderly users, or persons who must undergo a recovery training regimen. As opposed to this, the top 15-16 resistance settings offer the possibility to achieve a more intense muscle burn. The console unit included with this elliptical trainer is basically the same as for the ActionLine A81829 upright bike. It features a multi-panel LCD display which tracks the main workout metrics, including time, distance, speed, RPM, temperature, calories, and heart rate. The unit doesn’t have a SCAN function to rotate the workout metrics, but since it’s a multi-panel display you can see all the data at once. The console doesn’t have any amenities such as for other ellipticals. It doesn’t have a cooling fan or sound system, nor does it have a tablet holder. It does have a small speaker situated under the display, which enables it to beep at certain times during a program, or when you have completed a workout target. When it comes to heart rate, the console is not telemetric. In other words, it doesn’t work with wireless HR chest straps, such as the Polar ones. So, in order to benefit from a pulse reading, you must use the sensors integrated into the stationary handlebars. In terms of programs, the control unit features 12 preset workouts, 5 heart rate programs, 1 body fat program, 4 user programs, and the manual mode. The user-defined programs give you the possibility to create your own custom program. The manual mode allows you to change resistance as you pedal and when using a preset workout program, the elliptical will auto-adjust the resistance. The console unit is really easy to use. It automatically starts up when it detects pedal movement, or when you press a button. There are six buttons available on it. One covers the Pulse Recovery function, one is for the Body Fat function, the Up/Down keys serve for navigation and assigning values to a custom program, while the Enter key covers the confirmation function. Finally, the Start/Stop button serves the purpose of initiating a workout or pausing it in case you want to take a break or if you want to alternate an elliptical workout with other types of workouts. 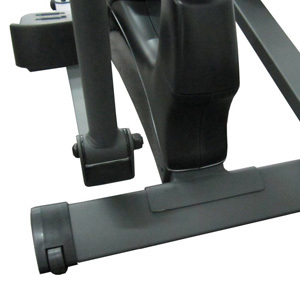 The core base of this elliptical trainer comes pre-assembled. The crankset, the internal motor, brake, and flywheel are already attached to the base frame and sealed by the plastic covers. Therefore, all you need to do for the assembly is attach the console mast, the pedal bars, the mobile bars, the machine’s base bars and the console. This shouldn’t take more than an hour. The included manual provides all the necessary assembly instructions, and some of the tools required for it are included. Internal maintenance is not needed for this machine, at least not for a long time, since the internal parts come pre-lubricated with industrial quality lubricants. On the other hand, the joints of the machine may require lubrication from time to time. Other than this, it is recommended to keep the machine clean, keep water or liquids away from the console, and periodically check for loose bolts and parts. 16 levels of eddy current resistance. 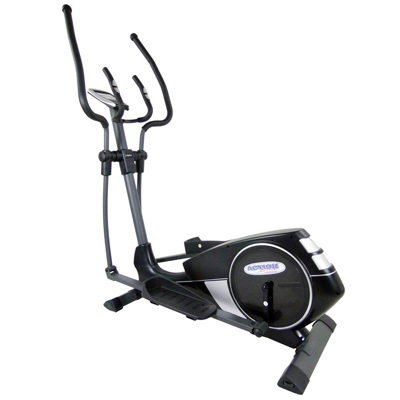 The ActionLine A83809 is a mid-range elliptical trainer designed for home use. 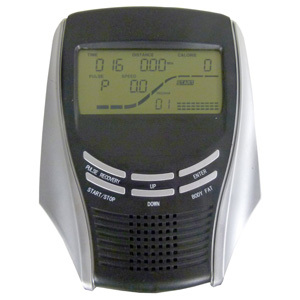 It offers 16 levels of motorized magnetic resistance, and 23 workout programs on the console. It’s a sturdy machine, being able to support users up to 250 lbs. It’s perfect for light to medium cardio workouts, weight loss, endurance training, and recovery training. And finally, it’s not exactly the most affordable trainer in this spec range, but does offer excellent quality for the price.